The NEPSE index as at Mid-November 2017 closed at 1,489.06 points compared to 1,701.91 points in the same period last year. The downward cycle in NEPSE began in the end of July 2016, which is still continuing. The major reasons behind this downfall is due to huge supply of shares as a result of listing of bonus and rights share following the capital increment requirement for BFI’s and Insurance Companies, and also due to higher interest rates being offered by BFI’s in FD and higher borrowing rates following the credit crunch being observed in the market. 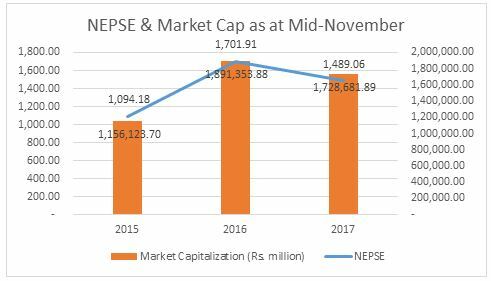 With the downfall in NEPSE, the market capitalization of NEPSE has also declined to NPR 1,728.68 billion in Mid-November, 2017 compared to 1,891.35 billion in 2016. 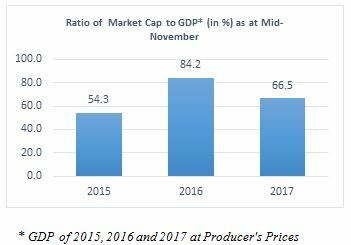 The ratio of market capitalization of NEPSE to GDP as at Mid-November 2017 has also dropped down to 66.5% compared to 84.2% last year during the same review period. The interbank rate of commercial banks as at November 2017 has significantly increased to 2.68% compared to 1.13% in the previous month. Looking at the trend of interbank rate, it has been increasing since last four months indicating liquidity management problem in the banking system. Such problem was observed during the same period last year as well. 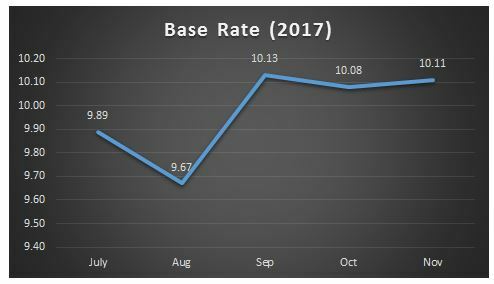 The base rate of commercial banks stood at 10.11% during Mid-November 2017 mainly due to higher cost of fund of BFI’s. In the last year, during the same review period, the base rate of commercial banks stood at 6.55%, which is lower than the current base rate by 54.35%. The consumer price inflation in Nepal stands at 3.90% in Mid-November 2017. 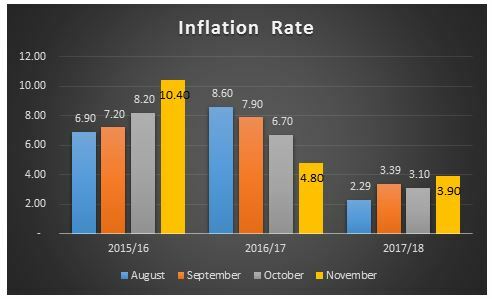 Though the inflation rate is in the lower side in the first four months of this fiscal year compared to previous two fiscal years, it is however slightly increasing. Moreover, the current market interest rate on deposits can easily beat this inflation rate. 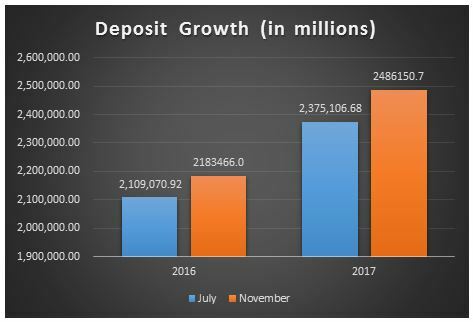 The deposits of BFI’s as at November End, 2017 increased to NPR 2,486.15 billion by 4.68%, compared to NPR 2,375.11 billion in July End, 2017. The growth during the same period in last year was 3.53%. 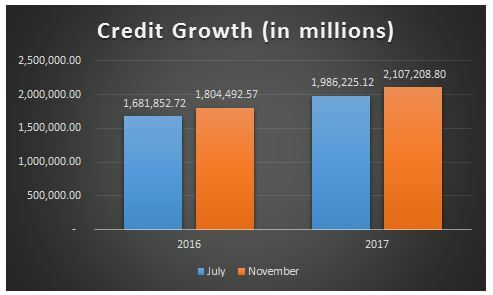 The credit disbursement of BFI’s as at November End, 2017 increased to NPR 2,107.21 billion by 6.09%, compared to NPR 1,986.23 billion in July End, 2017. The growth during the same period in last year was 5.74%. However, if we compare the credit growth rate with deposit growth rate of BFI’s, the credit growth rate is comparatively higher than the deposit rate, due to which BFI’s are facing credit crunch to disburse further loan. Despite the credit crunch in the banking system, NRB mopped up NPR 127.2 billion through open market operations in the first four months of FY 2017/18, of which NPR 42.45 billion was mopped up under deposit collection auction and NPR 84.75 billion through reverse repo auction on a cumulative basis. In the corresponding period of the previous year, NPR 92.25 billion liquidity was absorbed. In contrast, in the first four months of FY 2017/18, NRB has injected Rs. 132.47 billion through purchase of US dollars, however no any repo auction has been issued during this fiscal year to inject the liquidity in the system. 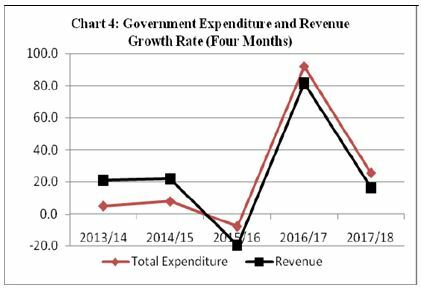 In comparison to first four months of FY 2016/17, the government expenditure has increased by 25.60% to NPR 176.70 billion as a result of successful completion of state and central level election, helping to inject some liquidity into the system. On the other hand, the government revenue witnessed the growth of 16.30% compared to corresponding period of the last fiscal year. The government revenue for the first four months in this fiscal year stood at NPR 195.43 billion. Our country has been witnessing a decline in remittance growth lately, which is an alarming factor as it is one of the major backbone to our economy. The remittance grew by 4.84% in FY 2016/17 compared to FY 2015/16. Likewise, the share of remittance in GDP has also dropped down to 26.80% in 2016/17, compared to 2015/16 when the share in GDP stood at 29.60%. 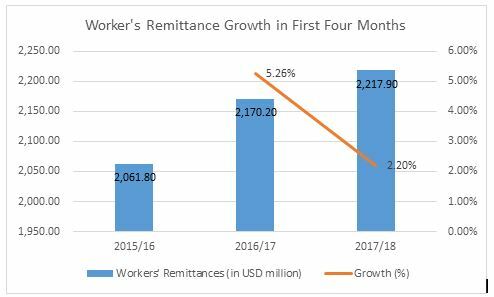 Looking at the first four months’ data of FY 2017/18, the worker’s remittance has witnessed a decline of 2.20% to reach $2,217.90 million compared to 5.26% growth in 2016/17. This can be an alarming factor as our country’s economy is highly dependent on remittance, and can impact money flow in the country & its financial system.